10 Foods That Prevent Hair Loss | Eat This! Doctors and researchers are still trying to discover the secret to preventing hair loss and so far the exact formula has not been discovered. However, there are several types of foods that can be eaten to strengthen the hair and help to prevent hair loss. These foods contain vitamins and minerals that are essential to maintaining a healthy, full head of hair. 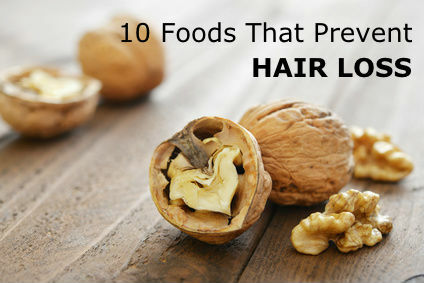 Essential fatty acids are an important nutrient for hair health and walnuts are a great source of fatty acids. It is suspected that these good fats have anti-inflammatory properties and that they help to strengthen the hair. Walnuts also contain biotin and selenium. Eating leafy green vegetables such as spinach, kale and Swiss chard provides the body with essential hair vitamins such as vitamins A and C, which helps the hair follicles produce sebum. Leafy greens also contain biotin, calcium and iron. Protein is essentail to healthy hair and beans are a great lean source of protein. They also provide lots of biotin, iron, and zinc. Like beans, eggs are a fantastic source of protein. They also contain all the essential amino acids needed for humans as well as B12, biotin, calcium, and iron. They’re also a great source of vitamins A, D, and E, which are located only in the yolk. Avocado contains several great things for your hair, including B vitamins, vitamin E, beta-carotene, copper, vitamin C, and healthy fats. Seafood is a great source of B12, zinc, iron, and other vitamins essential to hair health. Seafood is also rich in iron, zinc, vitamin D, selenium, and Omega-3 fatty acids. Tuna, crab, and lobster have the highest amount of selenium compared to other seafood. Oysters are particularly high in zinc. Alfalfa sprouts are an excellent source of silica, B6, B1, vitamin C, and vitamin E. They’re also high in protein, zinc, calcium, and iron. To get more sprouts in your diet, try blending them into a green smoothie with bananas, kale, Romaine lettuce, and strawberries. Whole grains provide you with a great source of B vitamins, as well as iron and zinc. All of these nutrients are essential to promoting healthy hair growth. Raisins are a great source of iron, which is essential to a healthy circulatory system. Circulation and blood flow is important for hair growth because it helps to stimulate the hair follicles. Raisins are also a good source of vitamin C, which improves iron absorption.